Background Adoption and maintenance of healthy behaviours is pivotal to chronic disease selfmanagement as this influences disease progression and impact. 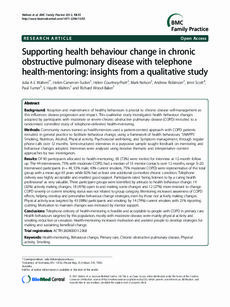 This qualitative study investigated health behaviour changes adopted by participants with moderate or severe chronic obstructive pulmonary disease (COPD) recruited to a randomised controlled study of telephone-delivered health-mentoring. Methods Community nurses trained as health-mentors used a patient-centred approach with COPD patients recruited in general practice to facilitate behaviour change, using a framework of health behaviours; ‘SNAPPS’ Smoking, Nutrition, Alcohol, Physical activity, Psychosocial well-being, and Symptom management, through regular phone calls over 12 months. Semistructured interviews in a purposive sample sought feedback on mentoring and behaviour changes adopted. Interviews were analysed using iterative thematic and interpretative content approaches by two investigators. Results Of 90 participants allocated to health-mentoring, 65 (72%) were invited for interview at 12-month follow up. The 44 interviewees, 75% with moderate COPD, had a median of 13 mentor contacts over 12 months, range 5–20. Interviewed participants (n = 44, 55% male,43% current smokers, 75% moderate COPD) were representative of the total group with a mean age 65 years while 82% had at least one additional co-morbid chronic condition.Telephone delivery was highly acceptable and enabled good rapport. Participants rated ‘being listened to by a caring health professional’ as very valuable. Three participant groups were identified by attitude to health behaviour change: 14 (32%) actively making changes; 18 (41%) open to and making some changes and 12 (27%) more resistant to change. COPD severity or current smoking status was not related to group category. Mentoring increased awareness of COPD effects, helping develop and personalise behaviour change strategies,even by those not actively making changes. Physical activity was targeted by 43 (98%) participants and smoking by 14 (74%) current smokers with 21% reporting quitting.Motivation to maintain changes was increased by mentor support. Conclusions Telephone delivery of health-mentoring is feasible and acceptable to people with COPD in primary care. Health behaviours targeted by this population, mostly with moderate disease,were mainly physical activity and smoking reduction or cessation. Health-mentoring increased motivation and assisted people to develop strategies for making and sustaining beneficial change.